Support Our Veterans This November 11 by Reading Their Books! While many Americans voice support and provide advocacy for veterans throughout the year, Veteran’s Day—which falls this year on Friday, November 11th—is a time for special attention and consideration. It falls on the same day as Armistice Day and Remembrance Day, celebrated throughout the world by countries involved in the major military hostilities of World War I, but it is not to be confused with Memorial Day, the day in May on which we honor servicemen and women who have been killed in the line of duty. On Veteran’s Day, we celebrate all of those who fought, particularly those who are alive today and face the daily challenges of having served in the American armed forces. And what better way to honor those who serve or have served than to read and remember their stories? This Veteran’s Day, we thought we’d highlight the work of several Outskirts Press authors who are also veterans, and it is our hope that you will take the opportunity to stop by our Outskirts Press Bookstore, which features not just these works but many, many more of note. There has been some chatter lately about our women veterans, and there’s no better entry point to the literature of the armed services than you can find in Ty Will’s The Female Veteran, a book which tackles everything from sexual assault in the military to active service on the front lines of the Drug Interdiction Mission. Author Ty Will served in the Army Reserves from 1987 to 1989 and then active duty from 1989 to 1992 before returning to the Reserves until her honorable discharge in 1995—so she really knows what she’s talking about! Fans of the Oscar-nominated documentary The Invisible War and those who are concerned with women’s issues or know a woman enlisted in the armed forces today will love Ty Will’s fearful and courageous book! Roger Mason, retired U.S. Army Master Sergeant with 21 years of service, has seen a lot. He served as a member of the Noncommissioned Officer and Officer Logistics Programs, the Association of the U.S. Army, the Ordnance Corps Association, and the Society for Technical Communication. After his retirement, he served as a government contractor—and decided to write about his experiences, sometimes even using metered verse and the tools of children’s literature to do so. You won’t see much of those last things here, in An Army of Stories, but you will see the world on Uncle Sam’s dime—a world rich in beauty and heartbreak, loss and peril. 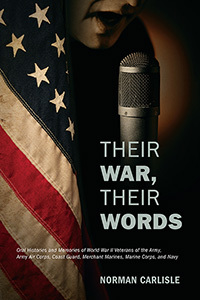 Norman Carlisle, too, has seen the world … and in Their War, Their Words, he makes the revolutionary choice to lend a voice to the memories of the “Ordinary Joe” serving in the United States’ armed forces, including those forces often neglected when recounting the larger narrative of Veteran’s Day. As he notes in his book description, “World War II left many memories. Some of these can be found in the biographies of Ike, Bradley, Patton, FDR, and Churchill. But what of the stories of others?” As much a document of our servicemen and women’s humility—many of whom would argue they are not heroes, simply doing their jobs and doing them well—as it is a living memorial for those who don’t have the voice to speak for themselves, Their War, Their Words is touched by Carlisle’s own experiences, too. Every member of his family, including his grandmother the civil defense aircraft spotter in 1942, has had a part to play in the story of this country’s armed forces—and this experience shows. This book is not to be missed! One hundred years young, Lt. Col. James A. Seals has lived a lifetime in service to America. He served through World War II and survived the bombing of Pearl Harbor, having delayed his return to the USS Pennsylvania in order to dine and dance with the hula girls in Honolulu. Even the summary description of what he and his friends witnessed the following morning as they walked back to their ship will give you the chills! 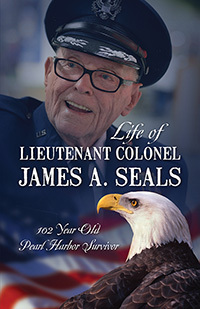 But there’s more: born in a log cabin in Tennessee in 1916, Seals went on to serve on military bases all around the world, and now lives in a much-decorated retirement with his daughter, Dr. Michele Seals McConnell—with whom he co-wrote his memoirs. And boy, do the Seals know how to spin a yarn! There’s nothing more moving than seeing conflict through the eyes of someone who lived it, boots on the ground and all. We’d like to take a moment this Veteran’s Day to honor our many wonderful authors who have served in the U.S. military. They have dedicated their lives to our country, and given us their stories to remember them by and, hopefully, navigate this often dangerous world more wisely. We hope you’ll join us in thanking them, and in reading these wonderful records of their service.